Taking the N-340 road you’ll reach the centre of Benalmàdena-Costa, where you will easily find road signs indicating the location of the hotel. By the motorway A7, taking exit 222 Benalmádena - Arroyo de la Miel. Turn left next to the Galp gas station, and continue straight ahead down towards the beach. When you reach a roundabout with windmills, turn left and continue straight ahead. A few meters to the right you can see the hotel. The Hotel Riviera offers our guests spacious and comfortable double rooms all equipped with air conditioning, full bathroom with complementary toiletry items, telephone, piped music, cable and satellite television, safe deposit box, minibar and free wifi. Include tea/coffe making facilities in all rooms. Our Beach Front Club rooms offer you large balconies and wonderful views. Some Beach Front Club Rooms are standard room size with a large balcony and stunning sea views across the marina and pool area, and some are more spacious rooms with a view to Benalmadena beach. All our Beach Front Club Rooms have an up to date modern bathroom which has a jacuzzi bath as well as a rainforest and normal shower head. All Beach Front Club rooms also have included in the price a safety deposit box; mini fridge (Minibar) with welcome drinks; tea /coffee making facilities; bottle of wine; bottle of mineral water; welcome fruit; pool towels to be collected in Reception (refundable deposit of 20,00 €); set of Club amenities in bathroom; bathrobe and slippers. All single rooms are outward facing and have telephone, cable and satellite television, full bathroom, air conditioning, heating, safe deposit box, minibar and free Wifi. Include tea/coffe making facilities in all rooms. 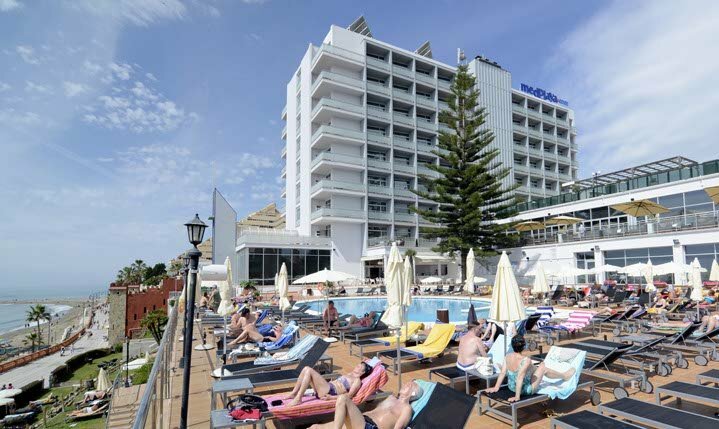 The four-star Hotel Riviera has a privileged sea-front location right next to the Maritime esplanade and Benalmádena marina, and less than 20 kilometres from the Malaga airport. There are spacious and comfortable rooms. The experience of many years allows us to provide a professional service that is dedicated to the comfort of our guests. Free Premium Wifi available throughout the hotel. The restaurant specialises in international and Mediterranean cuisine. Guests can also enjoy the daytime entertainment programs and night-time shows. The Hotel Riviera is especially recommended for adults (18 years and over). In Benalmádena, you will find activities to enjoy action-packed days while making the most out of everything that the nature, culture and special atmosphere of this Mediterranean destination have to offer. Med Playa Hotel Riviera (Benalmádena), received the certificate as Sustainable Hotel in its category Gold Award and the Prize "A True Commitment to Sustainability” given in Fitur 2015. • Bar Service (drinks and snacks). • Sun loungers and sunshades. • Daily evening entertainment programs (Professional shows: dance, live music and others). • Daytime entertainment all year. •Free Wifi in reception and lounge areas. •Room service available during bar opening hours (for drinks) and kitchen hours (for sandwiches and snacks). Our dining room offers buffet-style service, complemented by live cooking stations at the dinners. You will find a wide variety of Mediterranean and continental dishes to choose from. • Parking at the Hotel Bali may be used (100 meters away) - Subject to availability. Prices 0,42 € per hour..
• Sea-front location, next to the maritime esplanade. • Daily evening entertainment programs. • • SPA with indoor heated pool and different treatments available. • Spa and Wellness Centre: Enjoy a Spa circuit! Indoor pool, jacuzzi, steam room, sauna plus extra services including massages. Prices available in the hotel. • Free swimming pool towels available. Just leave a 20€ refundable deposit. • Restaurant Buffet. Meal times: breakfast (8:00a.m. to 10:30a.m. ); dinner (6:30p.m. to 9:30p.m.). • Restaurant a la carte Culinario. Meal times: dinner (7:00p.m. to 9:30p.m.). • No lunches served. Snacks available anytime at the bar. • Pool-side bar (only in the summer).